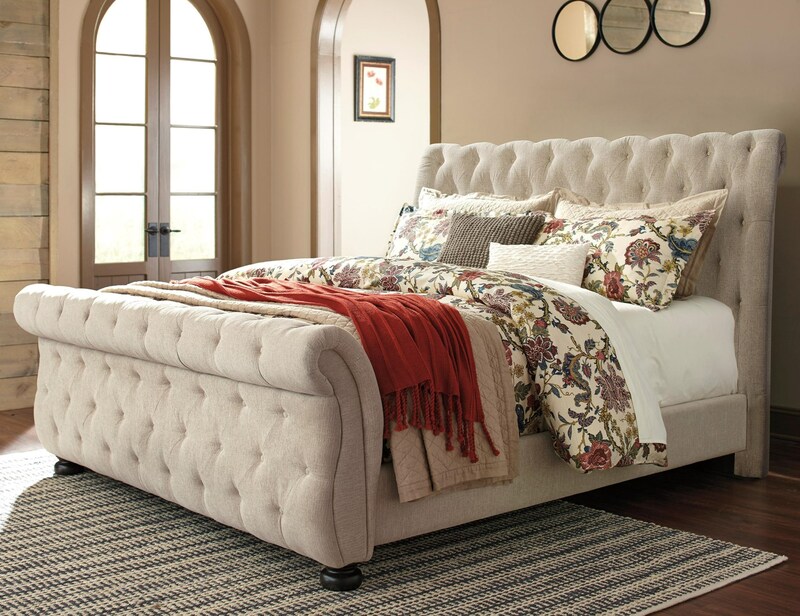 Relax in luxury with this stately upholstered sleigh bed. Upholstered in a linen colored fabric, It features diamond button-tufting, upholstered side rails, and a classic sleigh shaped headboard and footboard. Bun feet in a dark finish at the base of the footboard pull together the grand style of this upholstered bed. The Willenburg King Upholstered Sleigh Bed with Tufting by Signature Design by Ashley at Miskelly Furniture in the Jackson, Pearl, Madison, Ridgeland, Flowood Mississippi area. Product availability may vary. Contact us for the most current availability on this product. Browse other items in the Willenburg collection from Miskelly Furniture in the Jackson, Pearl, Madison, Ridgeland, Flowood Mississippi area.